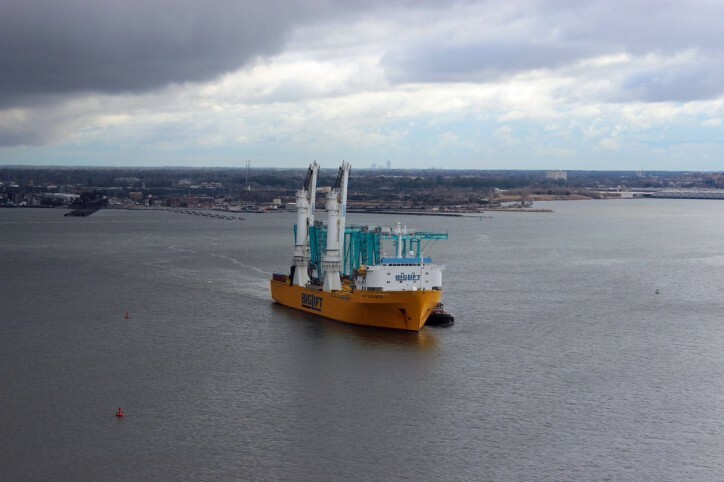 Crews at Virginia International Gateway (VIG) unloaded the first bundle of six rail-mounted gantry cranes (RMGs) following the arrival of the Happy Buccaneer, a heavy-load vessel that arrived in the Norfolk Harbor Friday morning. “Today marks the beginning of the delivery cycle for the centerpieces of our expansion, these cranes and 80 more just like them,” said John F. Reinhart, CEO and executive director of the Virginia Port Authority. “On a regular basis for the next two years we’ll be receiving these shipments and as we get them, we’ll put them into service as soon as they are on their rails and the testing is complete. 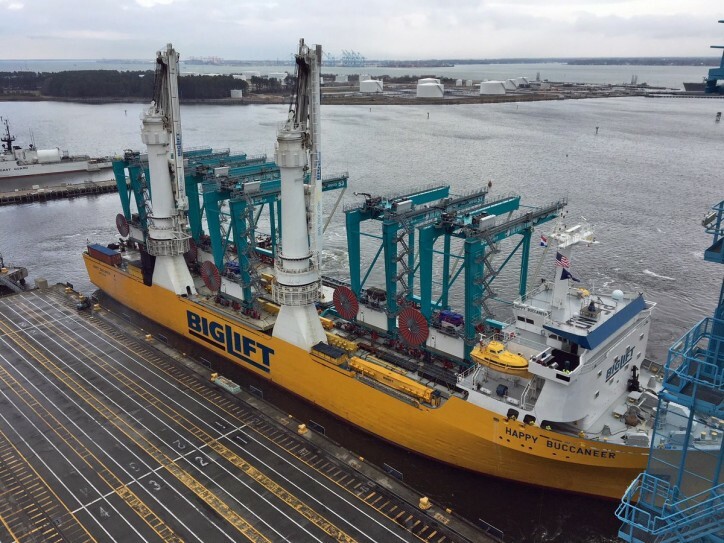 On Jan. 12, the Happy Buccaneer left Poland bound for The Port of Virginia® and started a two-year cycle that will see the delivery of 86 new cranes that are the centerpieces of the expansion taking place at VIG and Norfolk International Terminals (NIT). In November 2016, the port finalized a $217 million contract with Konecranes to fill the RMG order. The contract is the largest one-time order for automated stacking cranes (ASCs) in industry history. From this point forward, the port will be receiving regular deliveries of these RMGs to VIG and then it will transition across the river to Norfolk International Terminals (NIT). This first group of RMGs will go into service in April and the terminal’s container stack yard expansion will go into service at intervals through November. In total, 26 new RMGs will be delivered to VIG and the remaining 60 will go to NIT. The expansion at VIG will be complete by spring 2019. In February 2017, construction on the $320 million VIG expansion got underway. The work includes adding 13 new container stacks to the container stack yard – supported by 26 new RMGs – lengthening the berth, four new ship-to-shore container cranes, doubling the size of the rail operation and adding new lanes to the truck gate.